Indian Home style vegetarian cooking dishes,food recipes(cookbook). This is a hard bound book with the same illustration on the cover as well as on the laminated dust jacket. Matt art paper of 130 gsm has been used in the size of 219 x 196 mm. It covers 141 recipes out of which 135 are illustrated in colour. 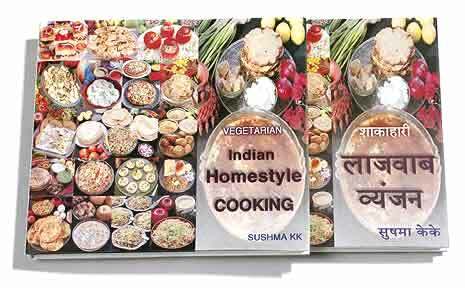 The cooking methods in the book are described by Sushma KK in a 'easy to follow and cook' style. She has bagged many prizes in different competitions held by Indian magazines and news papers. The design and photographs of the book are by K.K. Agrawal who has many National and International awards to his credit. Our eating pattern and cooking methods have changed with time and will continue to do so. Where hearth, wood and stove were used; gas, oven and microwave have come in. Because of these changes not only food of our states but also international cuisine make their presence felt in our homes. Now everyone desires to have tasty and nutritious food available right at home. How to make old & forgotten dishes in the modern form with convenience; this fact also has been borne in mind. In this book every recipe is presented with photograph so that we can get a feel of the dish before it is made, just as we like to see the model of a house before it is constructed. Dishes are illustrated with close range photographs so that it is convenient to understand. Text is also designed with a view to simplify cooking .